Everyone wants young and beautiful skin, so it comes as no surprise that many people have their eyes on products like the Dermal Meds Revitalizing Facial Serum. This particular anti-aging cream claims its better than Botox, and will make you look up to ten years younger. It certainly seems like something we would very much want for our skin, doesn’t it? But the question is, can we trust it? Lucky for you, we set out to research Dermal Meds to see whether it is a scam or the real deal so you can know whether you should buy it or not. DermalMeds Revitalizing Facial Serum is a new anti-aging skincare cream that reduces finelines and wrinkles on the face, giving you more younger looking and firmer skin. To get the best results you need to apply the cream on a daily basis. The cream is easily absorbable by your skin and non-greasy. All you need to do is wash your face and dry it before you gently massage the cream onto your face. You will see a big improvement within the first month, and your skin will continue to benefit from Dermal Meds with continued use. Are The Manufacturer’s Claims About Dermal Meds True? Forget about Botox, because there’s a injection-free, safe and more effective solution to youthful skin in town. Use Dermal Meds, and you can look up to ten years younger. That’s what the official website says. How do we know what the manufacturer is telling us is true? There’s no denying that these results are beyond amazing. How can we look away from them? More importantly, how can we believe them? Well, we looked into Dermal Meds to find if there was any evidence of clinical or scientific studies that prove its abilities to work wonders on the skin. We couldn’t find any double-blind studies that were specifically testing the product. But what we did find were studies that showed the effectiveness of the ingredients used in the cream. The official site wasn’t lying when it said that it’s product was “clinically proven”. We’ll be looking at each of the ingredients later on, but now we just wanted to draw your attention to a study that shows Dermal Meds isn’t just all talk. First of all, you need to know that retinol (vitamin A) is a key component in the anti-aging cream. The study we’re referring to was conducted by the University of Michigan in 2007. It was a 24 week randomized double blind study that demonstrated lotions containing retinol were able to improve wrinkles. This isn’t the only study on retinol – it has been extensively tested, as have the other ingredients in Dermal Meds, which we will come to. Dermal Meds works by targeting wrinkles at their source. The cream is easily absorbed by the skin when you apply it on your face, and it enters the deepest layers of the skin. Your skin basically consists of three layers: the outer epidermis, the dermis and the subcutis. It is in the deeper layer of the skin, the subcutis, where wrinkles originate, and this is where Dermal Meds works to rejuvenate your skin. Here it increases collagen and elastin synthesis, which are key proteins that give your skin its natural elasticity and firmness. These proteins tend to decline as you age, contributing to aging skin – but by increasing their natural production, Dermal Meds reverses the aging process. If you look at its official site, it talks about a 90 day system to give you younger looking, firmer and softer skin with reduced wrinkles. In the first month, your skin will absorb the ingredients of the cream and it will provide much needed hydration to your skin cells. The ingredients also start working at the source of wrinkles. 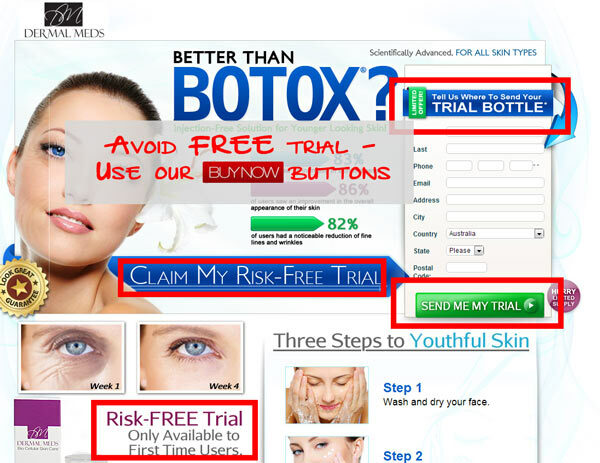 The site says you will notice immediate results and will give your face a “glow”. During the next 30 days, your collagen and elastin levels will be increased, and will fill and reduce your wrinkles. Dermal meds will also repair and renew your skin surface. In the third month, collagen and elastin reach their maximum levels and new skin cells are formed. After these pivotal 90 days, when you continue using Dermal Meds, it will continue to maintain and improve the firmness and youthfulness of your skin. What Ingredients Are Used In Dermal Meds? We found that Dermal Meds uses a small group of ingredients that each have powerful effects to fight signs of aging. All of the ingredients in Dermal Meds have been clinically proven and are used in many skincare products. We’ll break them down for you so you can get an understanding of what each ingredient does and how they work together to achieve their anti-aging effects. Retinol: Derived from Vitamin A, this is a key ingredient in Dermal Meds that has been widely tested. Retinol has been proven to increase synthesis of collagen and elastin in our skin’s deep layers. This is how the cream works “inside out” to reduce wrinkles by targeting them at their source. Matrixyl 3000: This clinically proven ingredient is a combination of fatty acid and amino acids that also boosts the skin’s natural production of collagen and elastin. It increases collagen synthesis by up to 117%, and significantly reduces wrinkle volume, density and depth. Haloxyl: This has been scientifically shown to remove the dark circles present under the eyes as well as discoloration of the skin. It also has anti-irritant effects and may help improve the tone and firmness of skin around the eyes. Eyeliss: This is a powerful peptide chain that removes fluid deposits that accumulate under the eyes, which has the effect of eliminating any puffiness or swelling around the eyes. So no more bags under your eyes. Renovage: A primary ingredient in many skin care creams, Renovage helps reduce wrinkles on your skin. It improves the longevity of telomeres, which allows the skin to generate more skin cells. Renovage also reduces discoloration, redness and inflammation of the skin, and it improves your skin’s tone and texture. Does Dermal Meds Have Any Side Effects? There hasn’t been any reports of side effects from Dermal Meds Facial Serum. It doesn’t contain any harsh chemicals, and instead uses ingredients that have been clinically proven not only in their effectiveness but in their safety as well. But just to be on the safe side, if you’re pregnant or breast feeding, it’s best to check with your doctor before you go ahead and use Dermal Meds. What Are People Saying About Dermal Meds? You may have seen Dermal Meds on the pages of Cosmopolitan, Dayspa and Allure. These are well known and widely read magazines which says a lot about how popular the product is becoming amongst women. The website says that it is also the choice of celebrities instead of risky and expensive skin procedures like surgeries, Botox and derma fillers. According to the website, users of the product have had a lot of success with it. It has made their skin firmer, reduced wrinkles on their face and improved the appearance of their complexion overall. We’ve only found positive reviews on the product, which is good news for those who are interested in trying it out. We couldn’t find many customer reviews or testimonials, as it’s a new on the market. But we expect there will be more as new customers give Dermal Meds a go. Where Can You Buy Dermal Meds And How Much Does It Cost? At the moment you can only get your hands on this anti-aging facial cream via their official website. No third-party websites like Amazon are currently selling Dermal Meds, but this may change in the near future as it is a relatively new product. Platinum Package: 5 containers and 3 free containers for $349.75. Customers on this package are able to request free refills every month and only have to pay for shipping & handling. They also offer FREE trial what as we know ties you into a monthly subscription. To avoid that free trial please use our Buy Now buttons at the start and end of this review. Dermal Meds is offering a free gift giveaway with each package – when you purchase their Revitalizing Facial Cream, you will also get their Instant Eye Lift product that is normally worth $69. Dermal Meds come with a satisfaction guarantee. They are confident that their anti-aging system will give you the results you want. If you’re not happy with the product for any reason, refunds are available. You just need to make sure you obtain an RMA to accompany the item you’re refunding, contact them, and send it back within 30 days. Also, once you place your order, you’re not able to cancel it – so you need to be certain that you want Dermal Meds. But if you decide that you don’t want it, you will have the option of getting a refund. After having an in-depth look at Dermal Meds Revitalizing Facial Serum, we have to say that we are quite impressed by the product. It appears to be an effective and safe anti-aging cream that gives you the results you’re looking for: firmer skin, reduced signs of aging, and a better complexion. It does this by using clinically proven ingredients that work together to give you younger looking skin. While there aren’t many customer reviews or testimonials on Dermal Meds, this is expected for a new product. The reviews can’t come from nowhere and it’s good to know that they aren’t being made up. Over time, there will be more reviews of Dermal Meds, and one of them can be from you! Different to many other skin care companies, Dermal Meds offers both FREE Trial option and normal payment options. We are firmly against any company hooking people in with free trials so if you want to be sure you only pay for the product once and won’t be involved in monthly payments then use our Buy Now button below. Enjoy! this product is way over priced! the free trial is very miss leading! the 2 products I got did nothing for my skin . This is the only article I’ve found on your website that reads like subtle advertising. Suddenly I don’t trust you anymore!! We always try to be impartial, so we are sorry if this review reads like advertising. Yes, sure, you should have no problem at all.